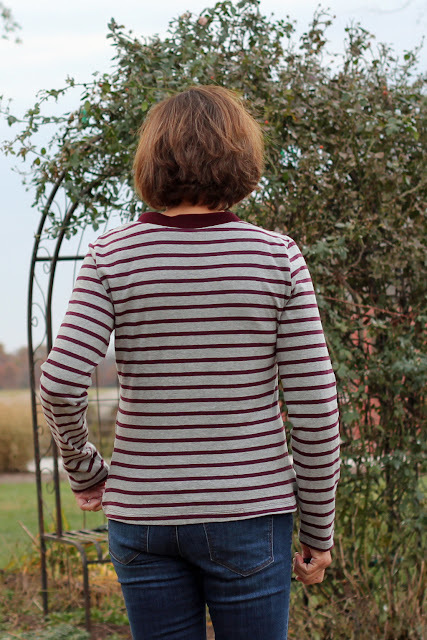 I had this Mood Fabrics' Knit Pique on my sewing table to make a Blackwood Cardigan and this stripe knit (I think Mood but not sure) waiting for a top. Well, look what I have - a perfect match! I knew right then I wanted to make that Vogue pattern. 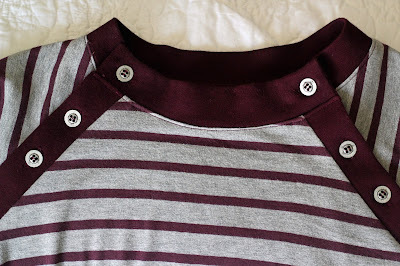 The trickiest part is the neckline and something I discovered after making this one, you don't really need to make the buttonholes except on the neckband. I just slipped this one right over my head without undoing the buttons. I did have to make my front and back neckband just a bit longer. The pique does not have much stretch, so a bit of extra length was needed. After I had this completed, I noticed the quite a bit or room just under the armscye and I didn't like how that looked. Well, I took it in about 3/4" and that might have been too much. I have a couple of fold lines above the upper bust. Also, this stripe knit is a bit stiff and not too much stretch. The pattern calls for knits with spandex. I love my shirt and will try it again in more appropriate fabric. I made a size 14 since, this was a close fitting top and my fabric had limited stretch. 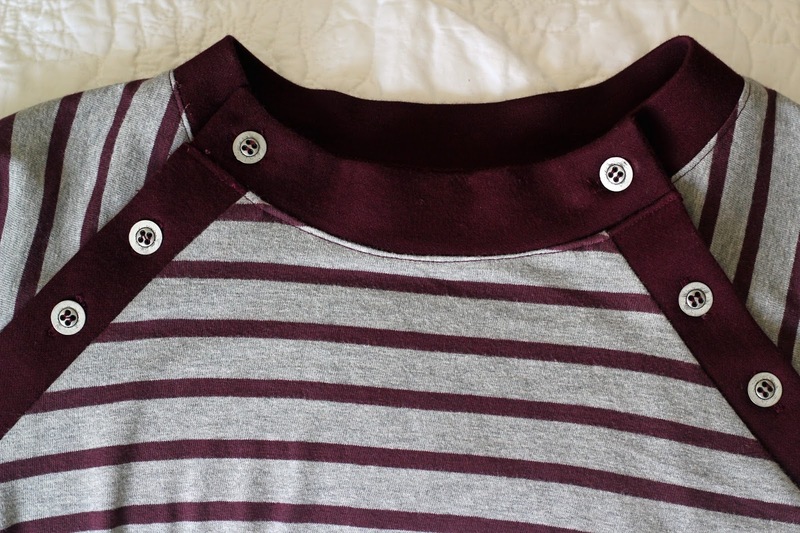 Another view of the neckline, buttons are from stash. I did cut the front yoke pattern with the stripes running a different direction. Play on the stripes and a bit less matching! I have the Blackwood finished and will share soon. I need cardigans in my closet and several pieces of fabric to make some. This fall/winter, I feel like I just need some basics to add some depth to my wardrobe choices. 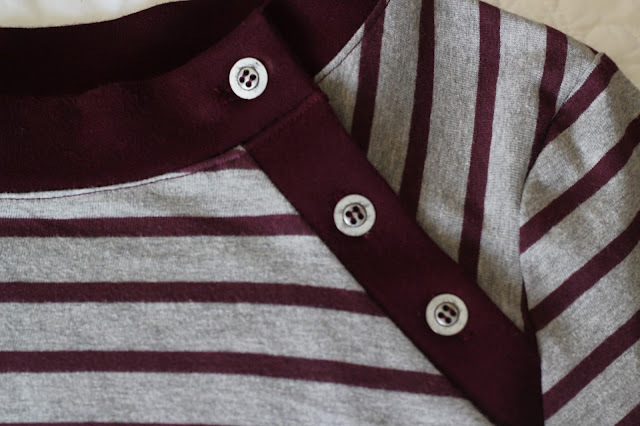 This stripe knit and solid pique are going to become three new garments. I love being able to stretch fabric yardage and make as many garments as possible. Nice top and love the different direction for the stripes! Thanks, I really had fun making it. I love this top and how you played with the stripes. I also love the solid strips and the buttons. When I first saw the first photo, I thought the buttons were grommets! Anyway, I love it! Thanks, I love the button, it is a fun accent. Isn't this pattern effective in the two fabrics! I love the multi-directional stripes at the shoulders. Thanks, I am so happy I finally made it! Love, love, love it! I'm eager to finish mine! Thank you, have fun making yours. I love this pattern and the combination of fabrics. Also the latest make is a brilliant use of your last scraps of these fabrics!